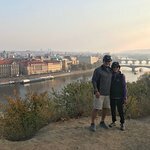 My wife, son and I visited Prague last week, what an incredible city. This was our first time on an E-bike and it was super cool. Takes a minute or two to get use to the little boost but after that, it’s an absolute breeze. 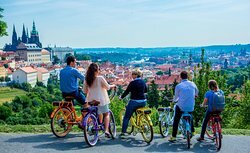 We chose Prague By E-Bike and I can’t imagine a better experience. Let me first touch on the tour itself. Basically, it lasted about 3.5 hours and took you on a complete loop and in/out of all the major sites plus a couple hidden gems. Our group was just us so obviously that made it great but don’t think their groups would get over 6 people. The terrain was pretty easy to handle with a couple small hills in which you just switch the gears. Besides getting to see everything and get a nice synopsis about each place, you stop in some of the most picturesque places in town for incredible views. Trust me, take the tour it’s worth it. We toured today with Michal and it was the greatest tour ever! We are from texas and hasn’t ever been to the city. 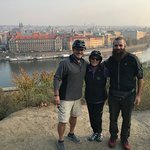 We went on the communism/WW2 tour on e-bike and it was non-stop entertainment and information. Michal is a walking encyclopedia. We were with our 10,11 and 13 year old children who were enthralled and can’t stop asking questions or talking about all they learned. Was the perfect tour guide, day and weather to soak in all the history! Only wish we had 5 more hours with Michal! Pack some water and snacks! He has rain coatts if needed. This was one of the oddest, most awkward and ridiculous tours I have ever been on. 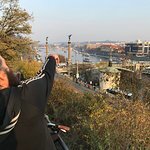 I’ve done bike tours in Copenhagen, Tokyo, Vancouver and elsewhere, but those were all completely outstanding compared to this mess of a tour. The day started off as expected with a slight drizzle of rain. I had researched the reviews of this particular bike tour the night before as I was worried that the rain might cause things to cancel. No one emailed or called the night prior to give a warning, so I assumed things were on schedule. I was also delighted to find that there were several reviews where rain had occurred during the tour, but the guides had carried on as usual. With this reassuring information on hand, I proceeded to the “Prague By E-Bike” tour. When I arrived, I was somewhat surprised to find what appeared to be the guide lounging in a dark room and calling out, “Hello, who’s there?” as I ventured in. There was no introduction, and I had to make a point to ask him his name before we even started the tour. He didn’t seem very happy to see me. I asked if I was in the right spot for the tour, and he made it a point to say, “Well, you’re the only one and it’s raining so...do you still want to do it?” I had just taken an Uber all the way to the office and had researched the night before. Of course, I was still interested! But why was this guy who was supposedly the guide acting like he didn’t even work there? And acting as though he could care less? It made for an awkward and extremely irritating first start to the tour. Based on that, I immediately asked him to give me the abridged version because I didn’t want to waste my time with someone who clearly didn’t want to be there. Reader, the three hour tour STILL took 2 1/2+ hours. The guy spent the tour regurgitating what was clearly the same agonizing spiel he had likely given everyone else in tours’ past and did so in a overly rushed manner and the most irritating tone. The views of Prague during the tour were spectacular, of course. 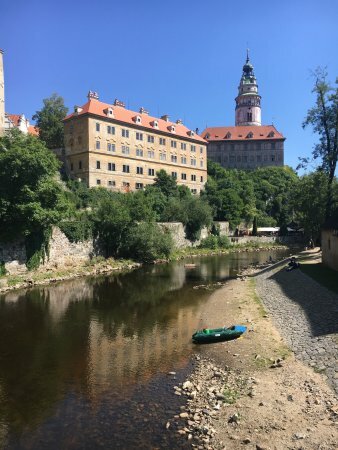 And the ride by the castle and Letná Park were among the most beautiful. But that really didn’t make up for the extreme awkwardness and unfriendly reception I received. I would strongly discourage anyone from booking with this company based on my experience. Decided to take the historical tour of Prague on Sunday morning. Turns out we were the only 2 people on the tour, with the other 2 who had booked not turning up but this just made the tour with ilgim more intimate. Despite being bit of a chilly morning, it was invigorating cycling around the different historical sites, hearing the facts behind those and having time to take photos as desired. From the shop where you collect the bike, you weave your way down to the old town, the Jewish quarters, across the river where there's time to stop for a beer and to take in the brilliant viewpoint from high up the hill, through the palace and then finishing back at the shop where you are given a complimentary beer to drink whilst sitting outside. Ilgrim certainly made the 3 hours pass by with ease and I have to say, her English was so much better than my Czech ;-) As for the electric bike, this was my first time riding one and I can't believe how much I enjoyed it, didn't break a sweat riding up any of the hills we faced on the tour. Tempted to buy one for myself now, although would feel a bit like a cheat ;-) If you get a chance of taking this tour, I would highly recommend it. Thanks again Ilgrim. We spent our 1st full day in Prague doing a walking tour of the amazing town squares. 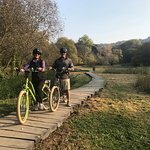 We spent a good part of the 2nd day on eBikes doing the nature loop with Jannis. We saw an amazingly beautiful part of the Prague countryside literally minutes away from the crowded squares. A wonderful way to get away and touch nature with Jannis as one who really appreciates sharing what he has found. 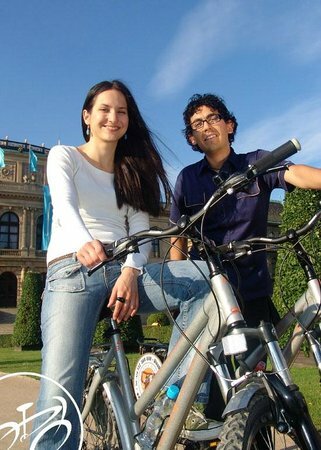 It’s nice to have an ebike in Prague! It’s hilly once out of the main square. They take you up high above the city. Great views! I was the only one on the tour. Passed lots of people on regular bikes and I was so glad to have the electric capacity!